After putting our new quartz in place, we still needed to put in the tap and hang the undermount sink. The first part was fairly easy, although the holes drilled in the countertop gave us some pause. Anyway, a hole is a hole. 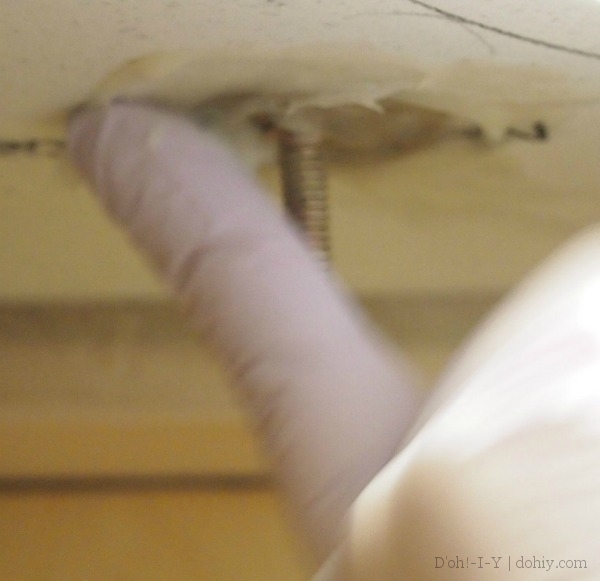 We were concerned that the rough edge would prevent faucet installation (and us without a diamond-tipped file to ream it out), but with some squeezing and breath-holding, everything went through. 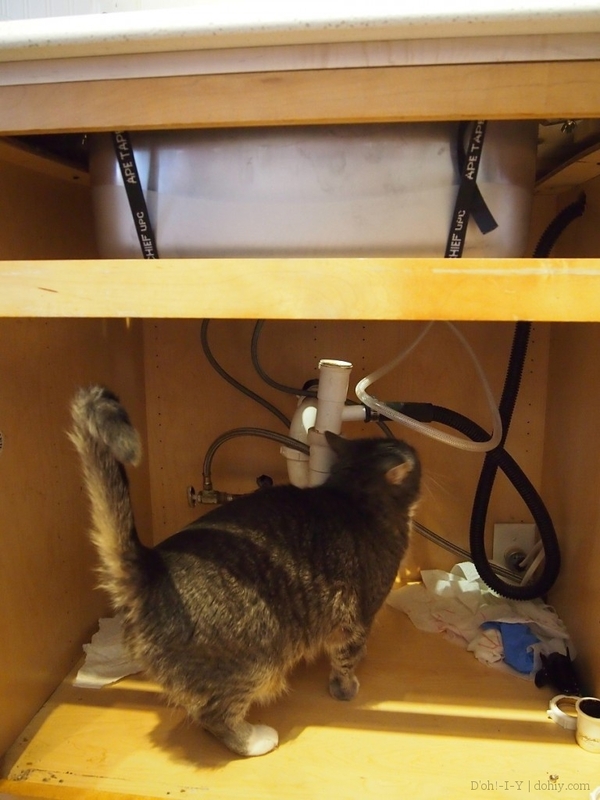 From there, it’s basically the same as hooking up any faucet, except we had an extra line for the sprayer and a hook-up for the dishwasher. The Kev: Hand me a towel. I forgot to drain the line before starting. Me: You should have read my tutorial! Me: Hello, we haven’t met. WE WRITE A HOME IMPROVEMENT BLOG TOGETHER. With that part done, we tackled the sink. Some sources recommend attaching the sink before installing the countertop, but that was going to complicate the lifting aspect of the installation (insofar as it would mean lining stuff up while hoisting the countertop). We didn’t want to make installation any harder than needed, since we were relying on the kindness of relations and neighbors. The first thing we did was put the sink in place against the underside of the quartz. We used a small bottle jack (and a wood platform so we didn’t dent the sink) to hold the sink in place. Once we had it right where we wanted it, I drew around the edge with a pencil. This line would keep us from epoxying something where part of the sink needed to be. Menards provides a box containing sink clips and epoxy with quartz orders. (Buyers can also opt for a $30+ package that includes caulk and shims, but we passed on that: caulk is $5 and we’ve got a drawer full of shims.) The funny thing about the clips is that they come with no explanation whatsoever. Here’s a bag of unexplained metal things! 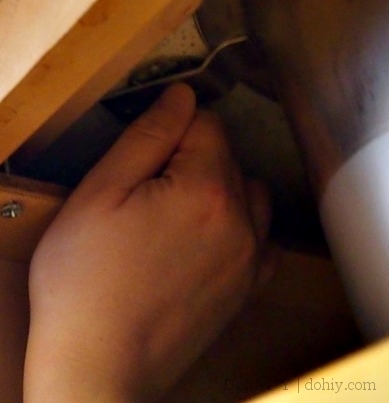 Wipe down the underside of the countertop with rubbing alcohol. Remove the wingnut and the clip from the bolt part. Put on eye protection and nitrile or latex gloves; open a window because this is going to get stinky! Mix the two-part epoxy (I used a shoe box top as a pallet and a plastic fork for mixing) in roughly 2″-diameter dollops. Scoop up the mixed goo with your FULLY GLOVED fingers, then smear it in a roughly circular patch at the target location. It has a lovely mucous-y consistency and color. Wrap something around the threads on the clip so they don’t get covered in goo (I used a paper towel). Push the flat bit firmly up into the goo so that it is flat against the countertop and the goo spurts through the holes. Hold it there for several seconds until it is well-seated. Carefully smear the goop that came through the holes around the underside of the flat part so it is fully encased in epoxy (but the threads are not). Wait 24 hours for the epoxy to cure before attaching anything. We received two containers of two-part epoxy with the clips, but because I am a novice, I used more than expected and we had to buy another container. Actually, we bought two and returned one when we didn’t break into it. The next evening, the epoxy was well and truly dry, meaning we could put in the sink. We jacked the sink back up and checked that it matched up with the traced line. 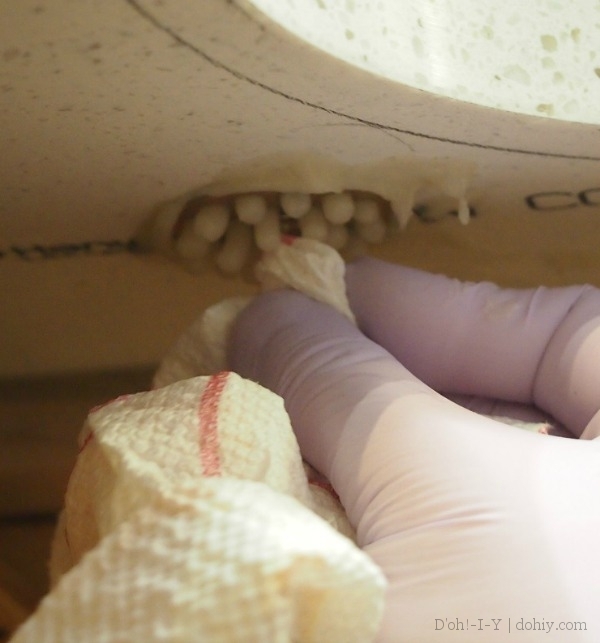 Then, we let the sink down just enough to apply clear silicon sealant to the top of the sink rim. Once there was a continuous bead there, we jacked the sink into place, checking again that it was within the traced line and that it was all correct on top. I used a paper towel dabbed in rubbing alcohol to help clean up the excess that was squeezed out. I was thinking we would need additional caulk (UK: mastic) around the join, but the silicon takes care of both jobs. 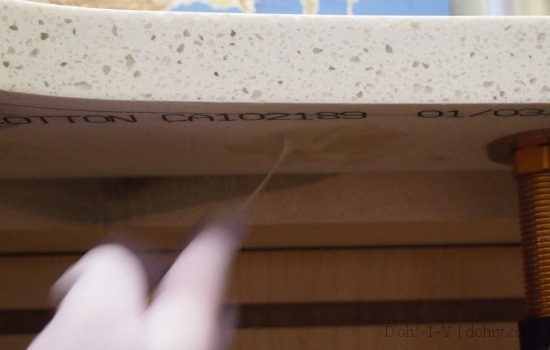 The silicon conveniently oozed between the quartz and the front rail, and we dotted it a few other spots underneath the counter to keep it in place (not that it was going anywhere). Once the silicon was all cleaned up (and leaving the jack in place), we installed the clips to the epoxied bolts. 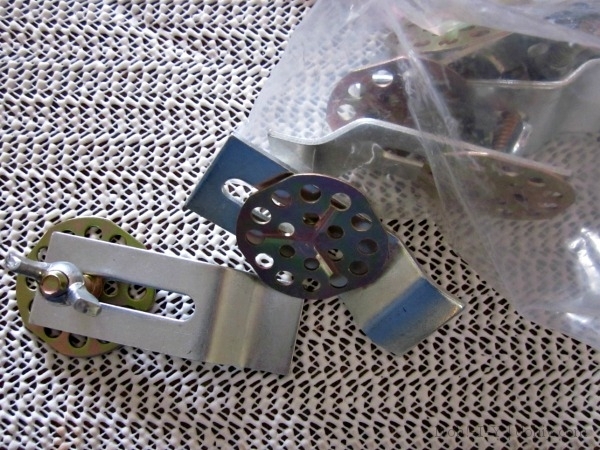 The clips go with the bump side up to meet up with the sink rim. We tightened these up, but not torque-wrench tight–just nice and secure against the rim. I finger-tightened, and then the Kev screwed them down a little further. 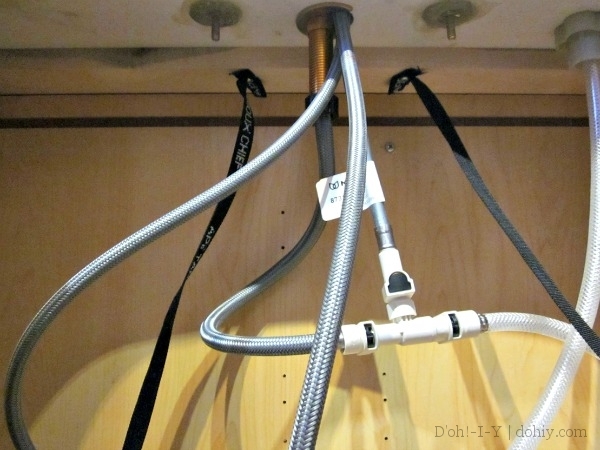 Our research indicated that many people rely strictly on the epoxied clips to hold up the sink. I understand that epoxy is strong stuff, but it just didn’t seem like enough. After reading about sink failures(!!! ), we wanted to add some support. 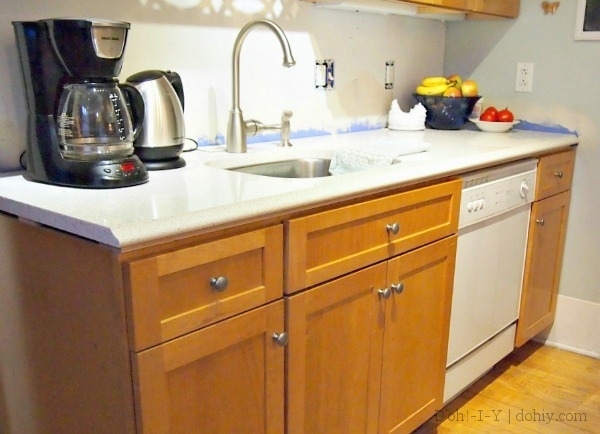 The slickest thing would have been to lay down a 3/4″ plywood base that completely covered the cabinets, use the template to cut out the sink, set the sink in, and then install the quartz on top, effectively sandwiching the sink rim between the two surfaces and providing the recommended support for the quartz. Then just add silicon sealant. 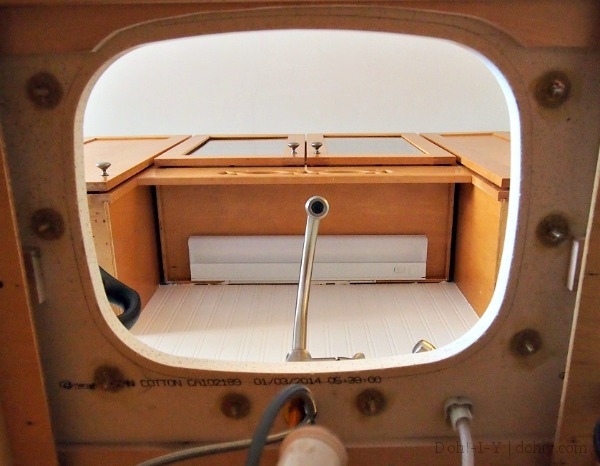 We didn’t find this clever option until the ship had sailed, but if you do DIY quartz, give this method some serious thought! Instead, we went for a technique we saw plumbers and fabricators arguing over online: running straps under the sink to cradle it. The main point of contention over this technique was whether or not it looked professional, and not whether or not it would work. I don’t spend a lot of time under the sink, so I don’t care what the support system looks like! The Kev picked up some strapping at El Menardos. 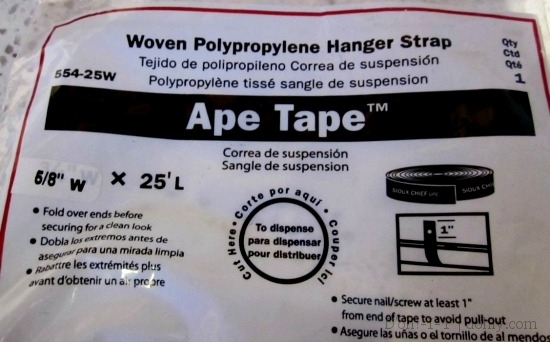 Ape Tape is rated to 125 lbs., and we were going to use two lengths, so 250 pounds worth of support seemed more than enough for epoxy-assisting purposes. We attached the straps to the wood behind the sink using some serious screws (and making sure to double over the Ape Tape and to screw through over an inch from the end). After the sink was in place and the clips were attached, we brought these straps to the front and attached them tightly to the 1×4 at the front of the sink (again being sure to fold over the strapping and to stay substantially away from the end to avoid pull-through). Instead of a coin, we used a fancy blade screwdriver. Kev had to push the existing drain pipe down a bit to accommodate the lower sink, and the pipe from the drain assembly had to be shortened a bit, but otherwise, it all went together quickly. We checked all the connections and did a leak test. We had a leak! The last connection before the wall just needed a little tightening, and we were back in business. The kitchen is operational again! Progress! Sink in, wallpaper gone, wall repairs underway. Other side: still need to get to the wallpaper backsplash and most of the wall repairs. Finish cleaning up the walls (wallpaper mostly removed now, and spackle is pending sanding). Caulk around the wall-edges of the quartz. Add matching trim to cover substrate. Add support under two small overhangs (not technically needed, but will look better). 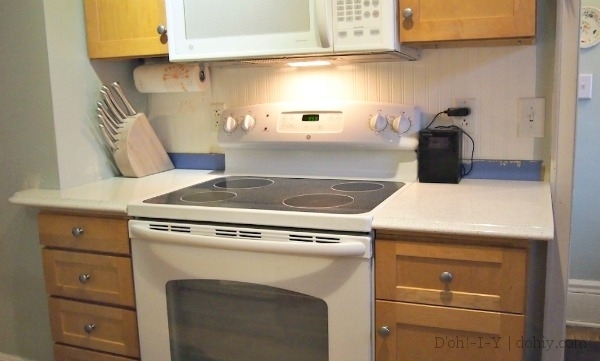 Eventually, we also need a backsplash. For now, though, I’m just basking in not obsessing about countertops any longer! 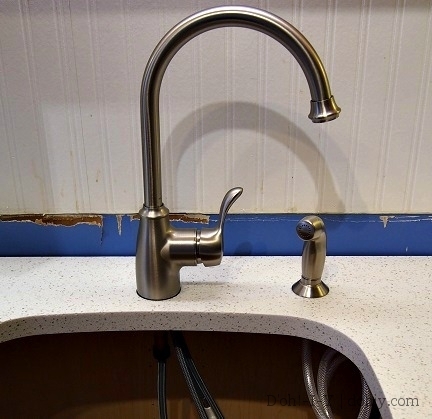 This entry was posted in American vs English, Before & After, Construction, Kitchen, Plumbing and tagged DIY undermount sink, how to put in an undermount sink, installing an undermount sink, installing undermount sink into Riverstone quartz. Bookmark the permalink. The kitchen looks great! The new quartz brings in a lot of light and although the kitchen wasn’t dark before, it has a whole new lightness now. Very nice. Mayya is a trooper – cat’s work is never done! S.
Thanks, Su — it does make a huge difference to the light in the room. Thinking of hanging a mirror ball to further the effect! You can buy a 10 pack kit on Amazon. These worked great for us. Cool — thanks for posting that option! 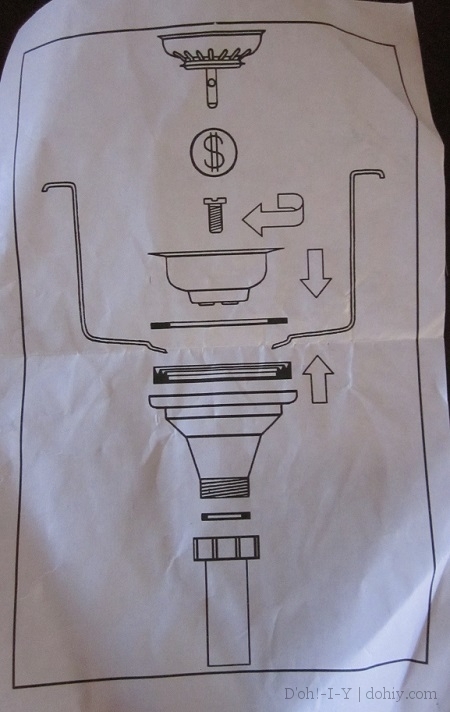 Thanks so much for this well documented and explained process. Your kitchen looks great! Your blog posts have been a HUGE life saver! We are in the finishing steps of our kitchen remodel and I don’t know what we would have done without your how-to’s. 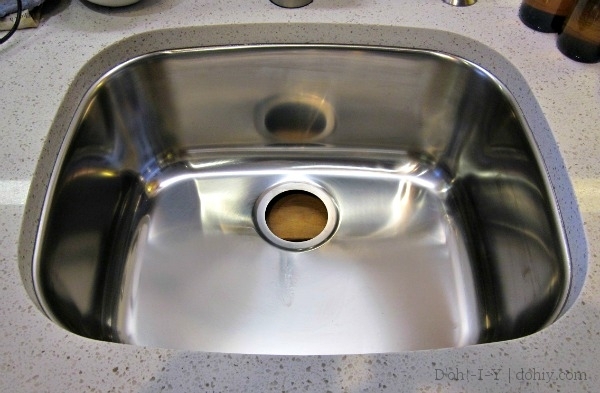 We also ordered our quarts from Menards and did an undermount sink (not purchased from Menards, so problems ensued with the custom cut out size) so again Thank you for posting your experiences and tips! Congrats on the new kitchen! So glad the post was helpful — it’s not the easiest project, is it?? Would love to see pictures. Thanks so much for your nice words! I just bought a new house with quartz countertops, but there’s no hole for a spray attachment or a water filter spigot. 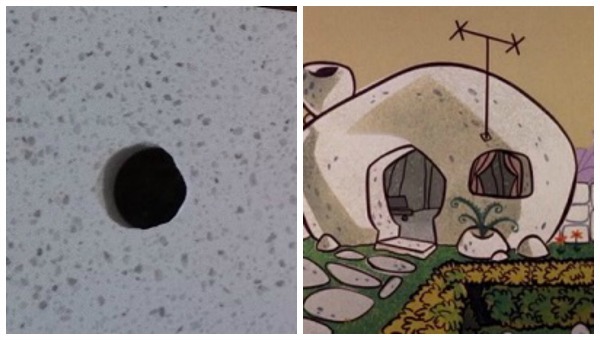 Is there any way to drill a hole after the quartz is installed? I think it can probably be done, but not with regular tools — you’d probably have to get a countertop place to come over and add it for you. Good luck! We are waiting for our new counters from Menards too. Thank you for the only solid advice on the internet! We are going to do the plywood as you suggested and sandwich our undermount sink! How did it go epoxying the seams of the counters? Shawna, sorry for the huge delay in replying — we didn’t have any seams, so I don’t have any advice there. How did it go? We had to have a professional do it. Our slab was too big to lift and couldn’t handle it. But they look lovely!